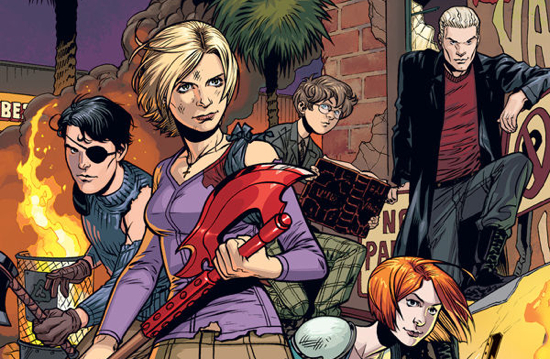 We’ve been following this one for at least a year now when word first surfaced that a new Buffy: The Vampire Slayer movie was in the works. Now, it looks like the deal is finally going through, although the players have changed a bit, and we will be seeing a brand new big screen incarnation of the character. I’ll let the excitement of that one sink in. Now for the disappointment: Joss Whedon will have nothing to do with the film. Yes, in the infinite wisdom of Warner Bros. and the new film’s producers, the man who created the character, the entire world in which she resides and guided the successful TV series through seven seasons will be left behind as this new project moves forward. Instead, the new film will be scripted by newcomer Whit Anderson who’s sole writing credit on IMDB is a film that hasn’t even been produced yet. In other words, she’s done nothing to prove herself or her work. Yeah, that sounds like a good idea. I’m sure her take on the material was really compelling. In case you can’t tell, I don’t really understand why anyone would think not having Whedon involved is a good idea. And I’m sure I’m not the only one. In fact, Joss Whedon himself thinks these development are rather strange and has responded to the news in true Joss fashion. He sent the response to E! Entertainment via email. Click through to read the whole thing. . . it’s pretty funny.